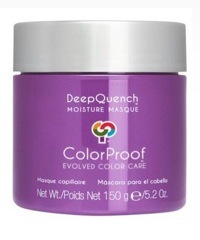 Quench color-treated hair with this rich, creamy, next generation masque specifically designed to infuse incredible moisture deep into the hair shaft. This miracle worker intensely hydrates, nourishes and repairs, all while prolonging color life and giving hair the special tender loving care it deserves. Give your hair the star treatment. Picture shown is the 5 oz tub. You are ordering the 1.38 oz. size.